The Sunny Central 2200 inverter produces 2,200 kVA from 1,000 V DC and allows for more efficient system design as it now works with an even broader range of module types. It has an integrated transformer and additional space available for installation of customer equipment, and has been optimized for outdoor installation. The air cooling system OptiCool™ keeps this central inverter running smoothly, even in extreme ambient temperatures. Sand and dust particles are effectively kept away. 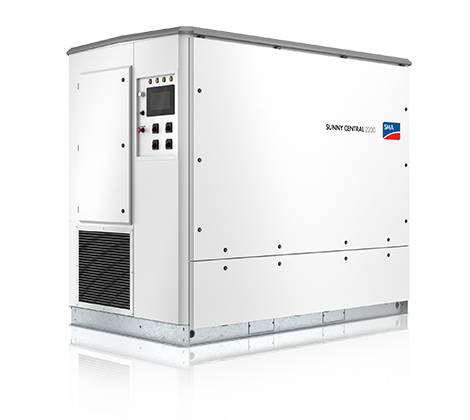 The Sunny Central 2200 is the central component of SMA Utility Power Systems. In conjunction with the medium-voltage block, DC technology, power plant controlling system and SMA Service, it is also available as compact a platform solution. KHMSOLAR © COPYRIGHT 2019. ALL RIGHTS RESERVED.